In the present day, Sophie (Amanda Seyfried) is getting ready for her big day: the grand re-opening of her mother Donna's (Meryl Streep) hotel. Simultaneously, the audience is shown the life of young Donna (Lily James) through flashbacks: how Donna met young Harry, Bill, and Sam, and more importantly, what convinced her to stay and live life on the island of Kalokairi. It's a movie that shows the beauty of discovering oneself, falling in love, and finding comfort in friends and family. This actress was known for her role as Lady Rose MacClare in the British drama series, Downton Abbey. She has also starred in Kenneth Branagh's film, Cinderella. Academy Award winner Meryl Streep was last seen in the movie The Post. But of course, we can never forget her role as Miranda Priestly in The Devil Wears Prada. "That's all." Prior to her role as Sophie, Amanda Seyfried was The Girl in the sci-fi thriller film, Anon. She also starred in films such as Lovelace, Dear John, and Mean Girls. This 65-year old actor is well known for his role as Secret Service agent James Bond in the movies The World Is Not Enough, Tomorrow Never Dies, and Die Another Day. He last appeared in the films Spinning Man and The Foreigner. Colin is known for his role in The King's Speech, where he played King George VI. Stellan is a Swedish actor who is recognized for his role in the film, The Man Who Killed Don Quixote. He also starred as John River, in the TV mini-series River. American pop superstar Cher last appeared as a performer in several TV series such as Beat Shazam and Britain's Got More Talent. The sequel was released exactly 10 years after Mamma Mia! (2008). ABBA members Björn Ulvaeus and Benny Andersson make cameo appearances in the film. Cher is just three years older than Meryl Streep, but she plays the latter's mother in this film. Think Julie Walters (the original Rosie) looks familiar? She played Molly Weasley in the Harry Potter movies! Cher was originally offered the role of Tanya in the first film, but she turned it down. 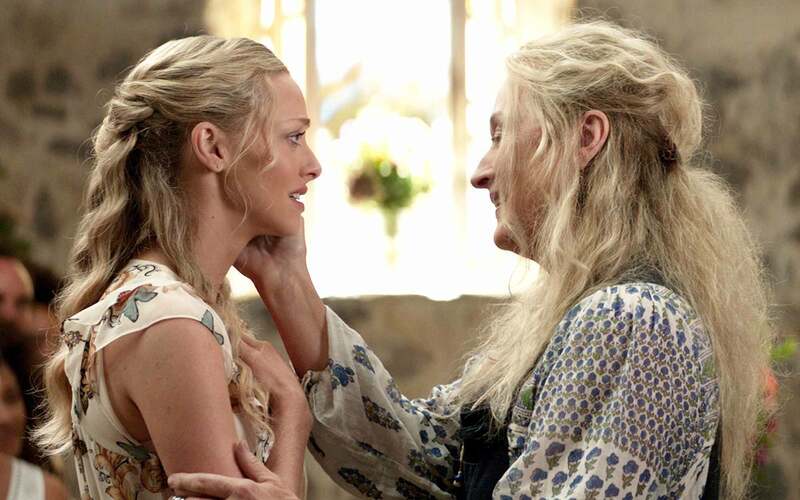 I absolutely LOVED Mamma Mia! when it was first released. I remember begging my friends to learn all the dance steps—who got to be Donna in Donna and the Dynamos was argued over just as fiercely as Beyonce's role in Destiny's Child. When I heard that a sequel was in the making with the original cast set to return, I had high hopes. I could not get over how beautiful the film was—I came expecting the over-the-top musical performances (and the cast definitely delivered), but Greece was just GORGEOUS. I could totally see why young Donna fell in love with the island (hot guys aside, of course). The cinematography was amazing as well, especially the blink-and-you'll-miss-it transitions in Sophie and Sky's first scene together. From watching the trailer alone, I already knew that I was going to love the film. TBH, I grew up with a dad who loves pop and rock music. A typical Sunday morning at our household would be nothing but chill because you'd hear The Beatles or Bee Gees songs blasting somewhere. Of course, ABBA was part of the playlist.